Whats everyones plans for trips this spring and summer.? Just got home from a 4 day trip in the Smokies. We have a 7 day exploration of Big South Fork National Recreation area planned for next month. Trying to plan out a trip for June where we can complete the Benton Mackay trail in the Smokies. 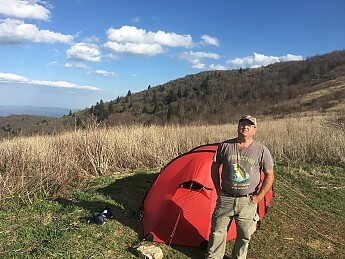 We need the Deep creek to Laurel gap shelter section and I would like to avoid climbing Mt. Sterling for the fourth time this year.My girlfriend wants to section hike the AT through the GSMNP or SNP once the leaves start to turn. My big spring goal is to complete the Hyatt Ridge manway in the Smokies. It's a long abandoned route that connects the McGee Springs area to Balsam Mtn trail near somewhat near the Tri-Corner Knob / AT junction. I've scouted both ends and just need to connect them up (sounds simple right? lol). It took me several tries to find the southern end as the old junction with McGee Springs is completely gone. My "big trip" this summer is still in planning but I hope to attempt one of the Wind River High Routes in Wyoming. Big Red and I considered trying together but the timing didn't quite work out. I may post an invitation for a partner but I need some verification of experience and fitness level on this one. The Skurka route is 97 miles (65 off trail) and includes 30,000 feet of vertical gain. Still considering a solo but that is a pretty darn remote place. Another part of my overall hesitation is time. I would plan for no more than 10 miles a day with all that climbing, navigating, route finding, talus walking, etc...but that puts me needing 10 days on-route plus travel time; it's a big investment of vacation time (on top of a week long family trip already planned) and would not allow much flexibility the rest of the year. But man.....97 miles without crossing a road sure sounds good! Late June 4 night back country Pemi trip, maybe bag Carrigain via Desolation or do the lowland loop depending on weather. July the little one goes off for her first year of Girl Scout camp so Frau Stanger and I are heading back to the Pemi to head up Bondcliff and then loop one way or another depending on how she feels after that first big climb with a full pack heh. August has a week long road trip early centered around a revenge attempt at Mansfield in VT. We have a couple nights booked at Underhill but haven't figured out where to go after that. Need a good spot in the woods to cook marinara for my wife's birthday as we've had that tradition for many years now. Late in the month it looks like we may be heading up to Nova Scotia, but we haven't figured out all the details on that one. As for personal trips I'm not sure I'm making any plans this year. Last year I made several big plans and the universe seemed to take offense heh. My 15 day June trip lasted two days due to conditions too slippery for even a Mainiac. I once slipped and fell down while standing still talking to someone. That is slippery!! Then my cold and wet LT plan that had me buying a heavier underquilt and considering bringing my Hillsounds ended after an unrelenting heat wave moved in and squatted over the trail for three weeks. No, I think this year I'm training for anything, but nothing in particular. Then, when the universe least expects it, I will make my move. I did spring for the annual federal parking pass, so that should motivate me to drive to NH more this year. Might also use it to park the scoot at the KW&W and do a mega IAT/BSP loop (which is why I was wondering what Pat was doing hehe), but now I've said too much. I know your time is limited Denis, but what are you hoping to do this year? Exactly 5 weeks from today I head for my bucket list trip crossing Scotland for 2 weeks. Excitement is at an all time high. Only negatives are a ridiculous overload of work this year and buying and moving into a new house at the end of this month are severely limiting training. First few days will hurt a bit I guess. Patman... Wish the Wind River trip was next year and I would join you. That is on my list too so will look forward to your report. Hmm, well this thread is an interesting development. Maybe I can join LS this year and Phil can join me the next? Phil, getting to do that particular route with someone that has your off-trail experience is significant and intriguing. Plus, I've hiked with you and I know first hand that you are fit enough to do it. I've started ramping up my practice with map and compass fundamentals this year in preparation but more time isn't bad. Trying to follow a bearing in the Eastern woods isn't easy though, so I've been really trying to think of local places with some good sight lines for practice. Sorry, I probably should have done more research first before getting you all excited Pat. Looks like with the opening of the National Monument next door Baxter has closed down the Katahdin Lake Exit/Entrance. Phone has been busy all morning with folks making reservations so I haven't been able to call the park office and verify if looping is no longer an option. I'm hoping you can still legally follow the route despite the closure of the official gate. I really enjoyed the loop I did last time. This time I was thinking of swinging through more of Baxter and hitting either Hamlin or Katahdin along the way, weather permitting. I'll let you know once I find out if this loop is still possible Pat so long as you consider giving me a year to get in shape for the Wind River trip. :) I have driven through there several times and love the smell of the air up there! With Phil to carry our heavy stuff it would be fun I'm sure heh. I am working at the North Rim of the Grand Canyon this summer from May to maybe as late as October. Job starts May 8th and the north rim closes Oct 15th. I plan to be day hiking and bike packing around the rim country. My wife and I are taking a leisurely five days to do the Paria in May. An old buddy of mine who has been ill is coming along after we suggested he could use the trip as a goal to get himself back in shape. We've allowed time for a full day's side trip up Buckskin Gulch. I would love to do the Wire Pass entry but it makes for a long first day and getting through the narrowest parts with a full pack isn't much fun. We did Wire Pass -Buckskin - back up the Paria as a long day hike in '11, and I remember looking longingly down the Paria at the confluence. Looking forward to doing the whole thing. Immediately after that we continue north to Moab for a six-day raft trip on the Colorado through Cataract Canyon. It's a bit of a splurge and not the sort of thing we usually do, but who knows when we'll be back in this neck of the woods and you only live once. No rapids for the first three days or so, but instead there will be time out for side hikes up away from the river. First week of June we'll be back east for a family multicelebration of various birthdays, including my 2^6th, anniversaries and a nephew's graduation. We'll head up to VT for a few days and will probably get in a day hike or two on the old stomping grounds. The White Mountains are my even older stomping grounds, and the Carrigan and Bond/Guyot areas are among my favorites thereabouts. Enjoy! For some of June and July I'll be back at the Rocky Mountain Biological lab in CO (while my wife is canoeing in Ontario), and we want to a week or so hike in the Maroon Bells of Weminuche when I'm done there. Heading back to Norway in August. Patman, I think we can cover about any trail we want to in 7 days. I did have to compromise and promise the girlfriend that night 4 would be at Charit creek lodge, $50 a person to tent camp but we get dinner, breakfast and showers. I haven't completely worked out the route but I think we are going to park at Bandy creek visitors center, head North and sort of spiral counterclockwise back to the car. You have any input or recommendations? Just in case anyone comes across this and wonders what the answer is as to whether you can still legally loop through there I got a definitive "probably" from the nice lady I talked to on the phone. I'll be doing a bit more research before I start booking reservations heh. With Phil to carry our heavy stuff it would be fun I'm sure heh. Based on your most recent review I am thinking a travois with a series of boot boxes strapped onto it would be appropriate. Jason, yeah I have some favorite BSF camps for sure as well as some features that you should include in the route. I'll reply in PM when I get a little more time. If yo uhave an older map it probably doesn't show that honey Creek area now connects to Leatherwood Ford but the Sheltowee Trace has finally been extended which is a really nice tie-in. LS, Phil and Big Red, heck who knows, maybe we can coalesce for a trip next year? That would be cool. I would love to team up with you all for that but don't wait on me... too far out to commit yet and would feel guilty if I couldn't make it happen and changed your plans. 'Course I already put in a tamer effort with my wife in the Windies in '16, but would happily go back and do it the hard way. But, heck -- Sawtooths? Canadian Rockies? Meet up midway in Iceland? Or maybe we could all just crash at Alicia and Dave's house in Maine! In the middle of planning a 5 day trip to the Matterhorn on the Canadian Rockies. Mt. Assiniboine. It’s 80 kms more vertical than I want to think about. Let's see: February was a week in Death Valley, then the Vancouver Wine Festival. March ten days in Joshua Tree and Grand Canyon. May at hone in Napa and Yosemite-- with a short trip to Chile. August a week around Sixty Lakes Basin...then starting to teach my classes at the college...in between shorter trips to the Sierra. Can you tell I'm retired? And loving it? All of my trips will be to the Sierra, with the exception of my spring and fall trips to Joshua Tree NP. My plans for spring are returning to my ski touring/mountaineering adventures. I took a sabbatical from these activities while raising my daughter, to assure she would have a dad at least until she was grown. She has graduated from college, so now I can indulge in my irresponsible pastimes, once again. I acquired new skis and lighter technical gear - the skis are pure joy, I merely think about turning and they do the rest! I am currently getting snow safety and ski mountaineering certs, to refresh what I have forgotten and learn what's new to the sport. Maybe even find a few partners in crime along the way, to accompany me next snow season; otherwise I am fine soloing. My family will cabin it at the Mono Hot Springs Resort, for a few days of R&R in July. Soon thereafter I am taking my daughter up Lamark Col to Mt Mendel and Mt Darwin for some rock climbing and fishing. I usually accompany an in-law on their family summer hiking trip, but they have not stated any plans at this point. I intend to take a couple of extended trips in the Sierra - a 70 mile loop from Glacier Point through the south end of Yosemite NP, and a 70+ mile hike out of Mineral King to the Kern headwaters, but so far have no takers. Thus these two strolls will be walk-up registrations as the agencies do not take reservations for one. After last summer when, for professional reasons, I barely had any vacation time to spend, I am again looking forward to the spring and summer ahead. My wife and I have promised our suburb-dwelling nieces and nephews to introduce them to a proper, multi-day camping trip (location TBD). Also heading west this summer and planning at least a few days of hiking between visiting friends in San Francisco and Portland. Exact hikes TBD, but I've been told that this eastern boy needs to see Crater Lake at least once in my life. Sounds like a good trip Denis. I keep thinking of getting out there myself as I have two kids currently in Pennsylvania so often end up in the area. Im going to Utah in September. Going to arches, bryce canyon, and zion national parks. I already have my longer hikes planned. I cant wait. I have driven through Utah a couple time and its beautiful. Its like being on a different planet. Being a PA resident, I've enjoyed sections of the LHHT a couple times (never all 70 miles). It's also worth checking out the Mid-State Trail, a little east of the LHHT, if you get a chance. If you're doing the LHHT in mid-June, it may be worth checking out the Beer and Gear Festival in nearby Ohiopyle, PA (June 16 this year). The gear is mostly tailored to the whitewater rafting/kayaking community, but the beer is tailored to anyone who enjoys a good brew. It's a great time! Planning on a few different 2 night trips this spring and summer. Havent done an over nighter yet so these will be my first. I'll be doing the west rim trail in PA and different parts of the mid state trail. We'll see how they go before I plan anything longer. I have two different solo trips planned for down in the Sierra's this summer. The first will be in late July and will be a 60+ mile trip from the Onion Valley TH north on the JMT to exit out over Bishop pass to South Lake. Then in early August I have a 60+ mile loop planned in the Sierra's starting at Florence Lake and heading in to the JMT and then north along the JMT to about Purple lake where I'll head down to Fish Creek (and fish!) and then back out over Goodale pass to exit at Lake Thomas Edison. If I can convince my wife, I would like to head down and do the rim to rim hike down in the Grand Canyon this fall, but it looks like getting a permit can be difficult. Mike that sounds great.Have you done a JMT thru hike before by chance? I like your Florence Lake/Edison Lake loop. I am intent on doing a similar loop, but heading in from the north, out of Devil's Post Pile, via Fish Creek Trail to Tully Hole; then returning via the trail paralleling Fisk Creek and the JMT, located up along the west side bench above Fish Creek. I was aiming to do this loop this summer, accompanied by some fishing junkie friends (this being an anglers dream hike) but they have declined. Instead I will do the previously described Glacier Point loop. Heck yeah baby. Finally get out for 1 nite!!! No plans due to new job at work ( bucket truck) and busy as heck. But for 1st time since December I’m out on a short over nite with nephew. at this moment we are set up back side of Tennet mountain N.C. This forum: Older: "National Parks don't need your Misty Eyed Reverence" Newer: have you ever had to triangulate with map and compass? Topic: Whats everyones plans for trips this spring and summer. ?